Do you have an existing system that has “never been just right” or no longer works like it used to? Let the team at Advanced Installations come out and do a system tune up for you. Do you use more than one remote control for your components? Do you need to leave the doors open in order for your remotes to work? Let us come and cure those problems for you. We will supply and install a universal remote control, Model number MX450 completely programmed to all of your existing equipment in a single room. Install a Luxul XBR2300 router with a Luxul XAP1010 wireless adapter, and provide your home with clear, fast wireless signal in all the areas of your home. This solution is for a 2500-4000 square foot home. Other solutions available for larger homes. Full installation and setup included with a 1 year parts and labor warranty. 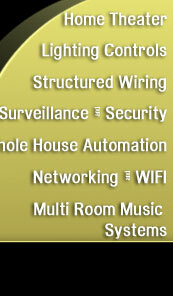 This is a professional, commercial grade wireless solution. Install a Digital Watchdog 8 channel 1 terra byte DVR with 4 Digital watchdog outdoor cameras in your home and setup your smartphone for remote and local access. All wiring, parts and labor is included to complete the installation. Your choice of 5 Speakercraft AIM8two series, in wall or in ceiling speakers. We have surround options from $1500.00 and up installed, this package is just one of many choices. Please call to customize any details. Want to put that unused space in your basement to good use? Let the team at Advanced Home audio video design and install a custom home theater room for you. Here is a pre-packaged deal that is fully customizable, just to get you started. All necessary township permits to do the work. There are many different styles and kinds of seating that will fit well into this room. We understand that everyone’s likes and dislikes of seating differ therefore we did not include any seating options with this room. We will be more than happy to help you find the best seating for your needs. Please see our product page for web links to any of the above items.